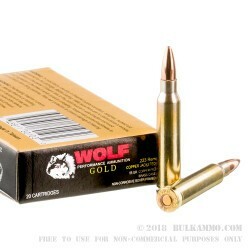 Wolf Gold is Wolf Performance Ammunition’s product line of choice for shooters who prefer brass-cased ammunition. 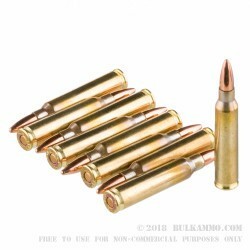 This .223 Remington load, suitable for AR-15s or any firearm chambered in .223 Rem or 5.56 NATO, features reusable boxer-primed brass cases and copper-jacketed bullets. The 55-grain FMJ projectile offers a ballistic profile typical for .223 rounds, perfect for range use in place of expensive self defense or hunting rounds. Unlike many other .223 rounds, Wolf Gold comes with sealed primers and bullets, a major advantage for long-term storage. Stock up on this ammo and it will be ready when you are. Wolf Performance Ammunition of Placentia, California works with global sources to bring affordable, high quality ammo to the United States. The Wolf Gold brand differs from the company’s other product lines in that it uses reloadable boxer-primed brass cases. 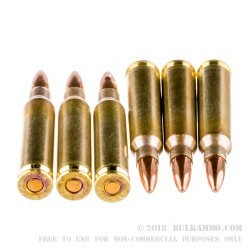 Wolf Gold in .223 Remington comes from Taiwan, where ammunition manufacturers primarily produce rounds for the Taiwanese military’s 5.56 NATO rifles and machine guns. A: Hello! Wolf lists the velocity of the Wolf Gold .223 at 3250 fps. A: Hello Colt! 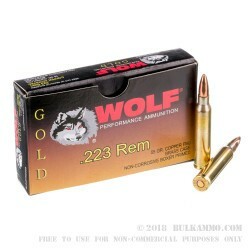 This Wolf Gold .223 does use reloadable brass cases! The projectile is also a standard copper coated, lead core bullet so it will pass any magnet tests!